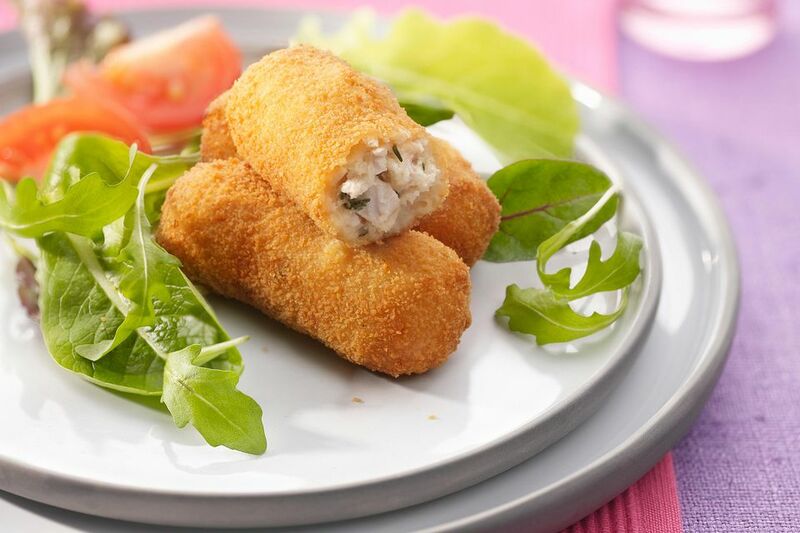 Chicken croquettes are made with chicken and minced onions and parsley, with a thick white sauce binding the ingredients. The croquettes are rolled in breadcrumbs and then deep fried to perfection. Croquettes have long been a favorite dish, and a tasty way to use leftover chicken or turkey. These can be made with leftover ham as well. If you're working in batches or would like to make the chicken croquettes up to 20 minutes ahead, place the drained croquettes on a rack in a pan and place in a preheated 200 F oven. In a saucepan, melt butter; blend in flour and salt and cook, stirring, for 1 minute. Add milk gradually, stirring. Cook over low heat, stirring constantly until thickened. Add chicken, onion, and parsley; spread in a greased shallow pan and chill thoroughly. In a bowl, whisk together eggs and lemon juice. Form chilled chicken mixture into 8 logs; dip each into egg mixture, then coat with crumbs. Heat deep fat to 365 F.
When the oil reaches, fry croquettes for about 5 minutes each, or until golden brown. Don't crowd them. Depending on the pan you use, you might have to fry the croquettes in two batches.